Vladimir Shlyapnikov is a professor, Doctor of Arts, laureate of international contests and festivals, laureate of the “Golden book of Fatherland”and “Golden bough of St.Petersburg”. Vladimir Shlyapnikov`s activity includes: organization of the First International Piano Courses in Russia, the School of Fine Arts under the patronage of the countess Sheremeteva, Russian-American Piano Institute, S. Richter Academy of Russian Piano Art, International center of Russian Musical Art, Shostakovich International Piano Competition (Russia-USA), Shostakovich International Competition (Russia-China), International Musical Festivals “Summer in Terijoki”, “Four seasons”, “Musical flowers” and others. Vladimir Shlyapnikov performs in Russia and overseas. His recitals have been accompanied by musicians from Bolshoy and Mariinsky Theatres, the Academic Orchestra of the St. Petersburg Philharmonic Hall, St. Petersburg Capella Concert Hall, the St. Petersburg Conservatory and many chamber choirs and orchestras. 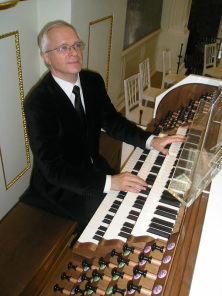 He has written numerous books, articles and study guides on the piano and organ artistic performance.